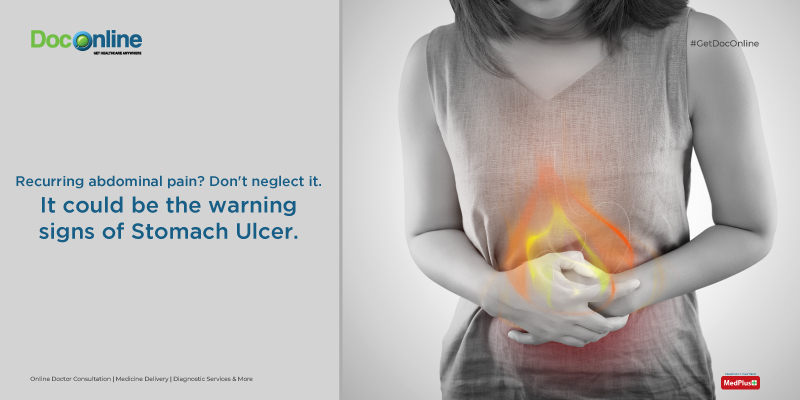 An “ulcer” is basically an open sore. The origin of the word “peptic” has its root cause in acid. It means that the problems arise due to acid. Duodenal ulcer and gastric ulcer are the two most common types of peptic ulcers. Depending on the locations where these ulcers are found, the ulcers are named accordingly. Ulcers located in the stomach are called gastric ulcers. Duodenal ulcers are found at the beginning of the small intestine, which is also called the small bowel and known as the duodenum. It may be noted that a person can experience both gastric and duodenal ulcers at the same time. It is surprising to learn that many people with ulcers exhibit no symptoms at all. Some people with an ulcer may show epigastric pain. Such pain is often associated with the upper abdomen. Sometimes intake of food can make the pain better, and sometimes it can even make it worse. Other symptoms can include nausea, vomiting, or experiencing a sense of feeling full or just feeling bloated. It is important to know that there are many reasons a person can experience abdominal pain but that does not mean that all necessarily pertain to ulcer. It is important to note that bleeding from an ulcer can be slow a slow process and go unnoticed. More importantly, it can also cause life-threatening hemorrhage. Slowly bleeding ulcers might not exhibit the symptoms until the person becomes anemic. Symptoms of anemia also include fatigue, pale skin colour and shortness of breath with exercise. If bleeding occurs more rapidly, then melena might show up. Melena is jet black, very sticky stool. Additionally, even a large amount of maroon dark red blood in the stool may be present. There is a tendency among people with bleeding ulcers to also vomit. This vomit may look like “coffee grounds” or be red blood. Other symptoms can include feeling lightheaded or “passing out”. One should consider medical emergency if there are symptoms of rapid bleeding. If this occurs, one should immediately seek medical attention. Helicobacter pylori and a group of medications known as NSAIDs are the two most important causes of ulcers are infection. The bacterium that lives in the stomach of people experiencing the abdominal ulcers and happens to be the cause of the same is the Helicobacter pylori. It is also called H. pylori or simply “HP”. The understanding of H. pylori and establishing its connection with the cause of ulcers was among the ground-breaking late 20th century medical discoveries. People having this bacterium were more at risk of developing peptic ulcers. Thus, it is not surprising that when a person is diagnosed with an ulcer, testing for H. pylori is often routinely done. A number of tests need to be done to diagnose the presence of H. Pylori. The treatment usually consists of taking either three or four drugs. There is a drug therapy, which uses acid suppression therapy in conjunction with a proton pump inhibitor (PPI). Often an antibiotic therapy accompanies it and sometimes a bismuth containing agent as well. Curing H. pylori can be very tough. Thus, it is extremely important for people suffering from it to religiously take their dose of antibiotics as prescribed and complete the course. Besides, eating disorders like anorexia nervosa also cause stomache ulcers. A group of medications typically used to treat pain is known as NSAIDs (non-steroidal anti-inflammatory drugs). A few of the many drugs in this group include: ibuprofen, aspirin, and naproxen. As paracetamol/acetaminophen is NOT an NSAID, therefore, it is the preferred treatment for pain for patients suffering from peptic ulcer disease. NSAID use is a very common cause of peptic ulcers. How do NSAIDs cause ulcers? They do so by interrupting the natural ability of the duodenum and the stomach to protect themselves from the stomach acid. Besides, the NSAIDs also can pose hindrance by interfering with the blood clotting when the ulcers bleed. People who are in the habit of using NSAIDs for a long time and especially at high doses, they tend to have a higher risk of developing ulcers. These people should clearly discuss their various ailments and the possible options for preventing ulcers with their physicians. The typical way to diagnose ulcers is through endoscopy. Besides, other ways in which ulcers can be diagnosed are with the barium swallow or upper GI series. By quitting tobacco products, and saying no to smoking cigarettes, maintaining a healthy lifestyle, eating a proper balanced diet rich in vegetables, fruits and whole grains will help in preventing the development of peptic ulcer. Moreover, avoiding alcohol and limiting the use of pain killers, coupled with meditation and exercising will keep peptic ulcer at bay! Of-course, you can always consult a doctor online in the event of any necessity and have get yourself treated!